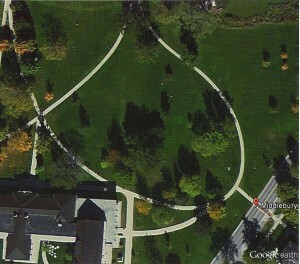 Landscape architects sometimes speak of ‘desire paths’-a phrase that means exactly like it sounds. Laying out sidewalks, driveways, or trails is considerably harder than it looks. A budding architect can either be a hero for guessing exactly where pedestrians want to walk, or a goat for taking an urban mentality and assuming people will use the sidewalk regardless of location. 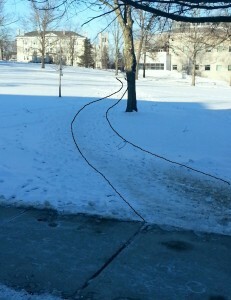 Try as we might, the Middlebury campus is full of desire lines. Some are an easy fix. Two new sidewalks cut across the top of the Atwater quad based on dirt paths that had appeared post-construction based on pedestrian traffic flow. One that couldn’t be done, a dirt path from the Johnson Parking lot to Atwater dining, we tried to block with trees and shrubs, but the desire remains unabated. 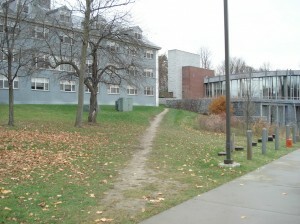 Another one that concerns us is a dirt path from Battell Beach heading toward Milliken Hall. This cuts in a straight line up slope, and is becoming so worn down that it may soon start to erode. 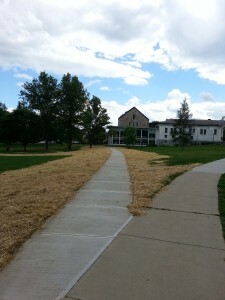 A new desire path appeared after the renovation of The Axinn Center at Starr Library. The northeast corner of the building, down by Route 30, houses several large classrooms, and students cut across the quad from the Main library down to that corner. Not that we blame the pedestrians. It’s cold here. Getting from point A to point B as quickly as possible makes campus life a little more tolerable in January and February. It’s a pretty obvious place for a walk, but the problem is the other walks in the space. Before my time, the walk ways were redone, and came out beautiful. This is landscape architecture at it’s best. Gently curving paths arc across the space, connecting the buildings that surround the quad. The brilliance of the plan is the fact that they work. In colder climes like ours usually corners are cut, curves straightened, and shortcuts abound. 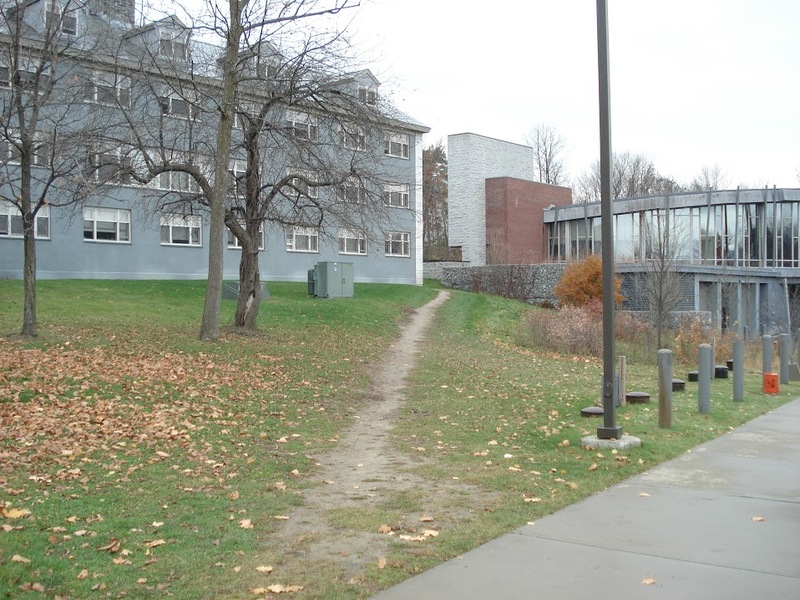 The desire line from the library to that corner was, as expected, straight, and pouring this as a walk would break the beautiful rhythm of the rest of the walkways. 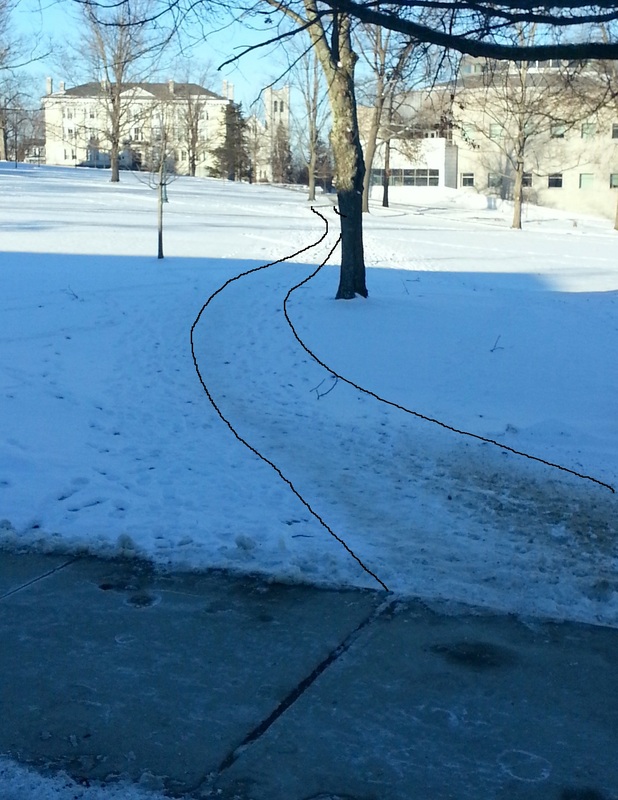 Then, after one winter storm, the path was beaten through the snow, this time gently arching around some trees, eventually meeting the walkway to the library. With this proof of concept, we were off and running. 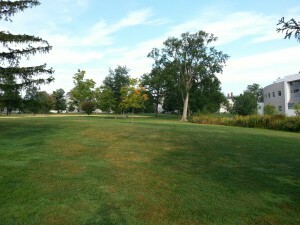 Last summer we went out to the quad with surveyor flags, and marked a potential route. Some language school students became willing test subjects, and we tweaked the lines for an hour or so until it flowed right. The other, even more subtle brilliance of the walkway layout in the library quad is the way the sidewalks are blind, hidden from view. I bet few people have noticed this, but a picture makes it obvious. 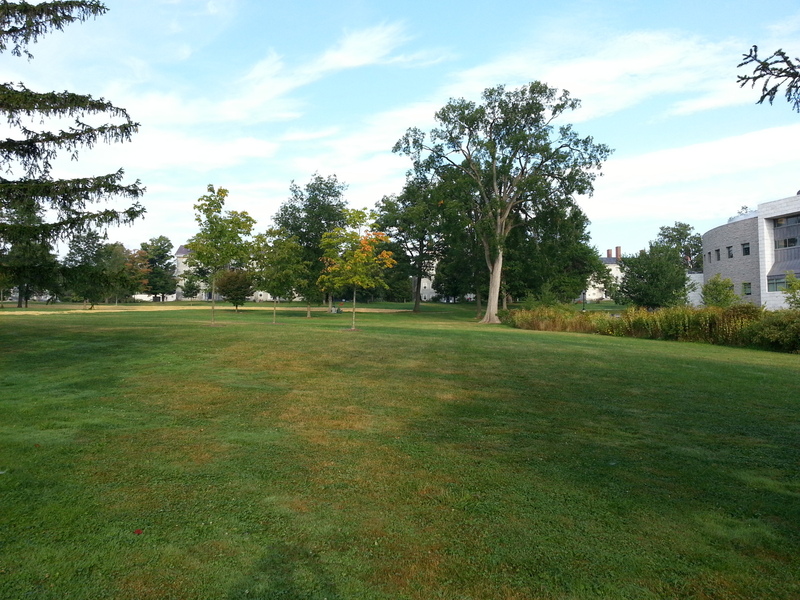 Looking up from Route 30, the quad appears to a large expanse of lawn, unbroken by walkways. The art is in the subtle placement of the walkways. All of them are slightly built up on the route 30 side, and pitch towards Old Chapel Road. Leaning the other way, the flat expanse of the walk would be visible, but the design at present allows them to be blind, not seen from the road. Obviously that couldn’t be done had the road been higher than the quad, but geology and geography was on our side this time. The new walk was tricky to match this effect. Its placement across the quad required some elevation of the surrounding area, as well as some grading to continue the natural water flow across the lawn. Had this been interrupted the sidewalk would pool water and turn into an icy mess.